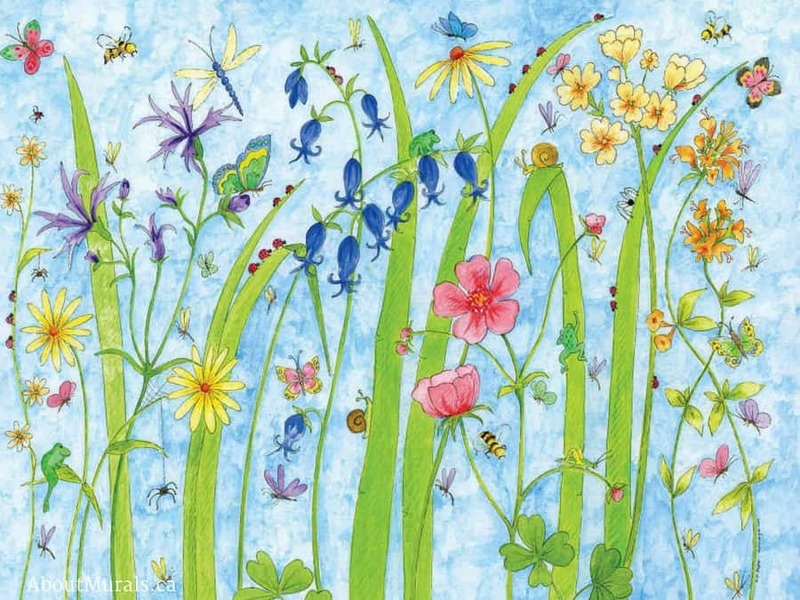 Are you looking for a pretty butterfly mural for your little girl’s bedroom? I hear ya – I love this theme so much I painted it in my own daughter’s bedroom. 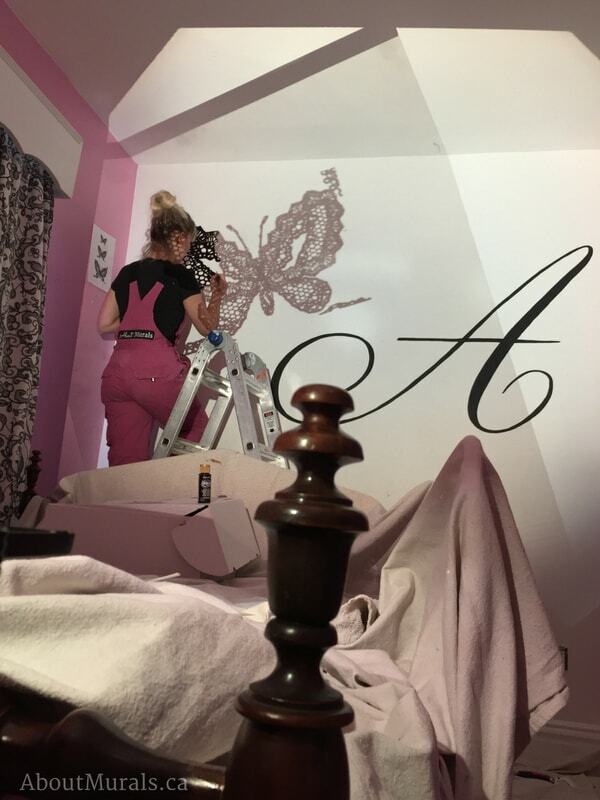 I thought I’d share some photos of her butterfly mural and a quick tutorial on how I painted it, so that you could get some inspo. How can you get your own butterfly mural? Hire me! 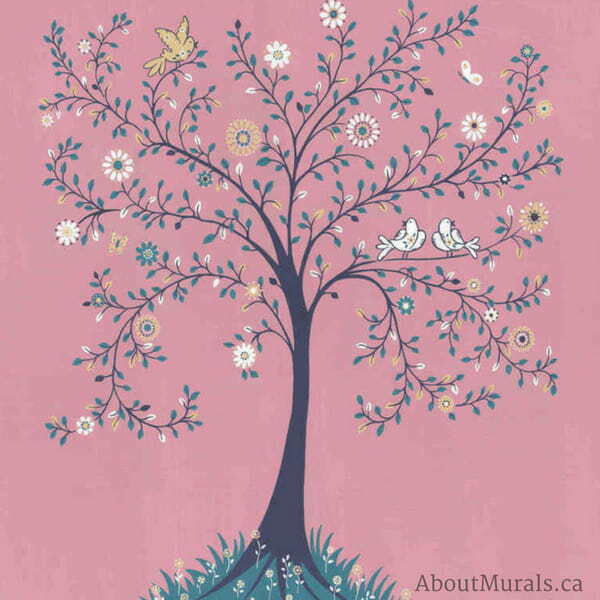 I hand-paint kids wall murals in the Hamilton/Toronto (Ontario) areas. DIY! Keep scrolling down to see how I painted her butterfly mural. 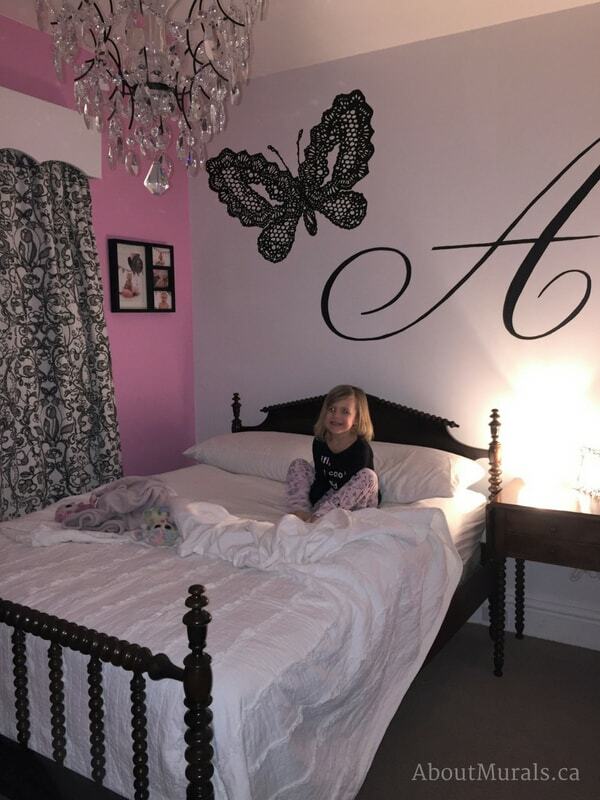 So here are a few photos of my daughter’s butterfly mural in her “big girl” bedroom. 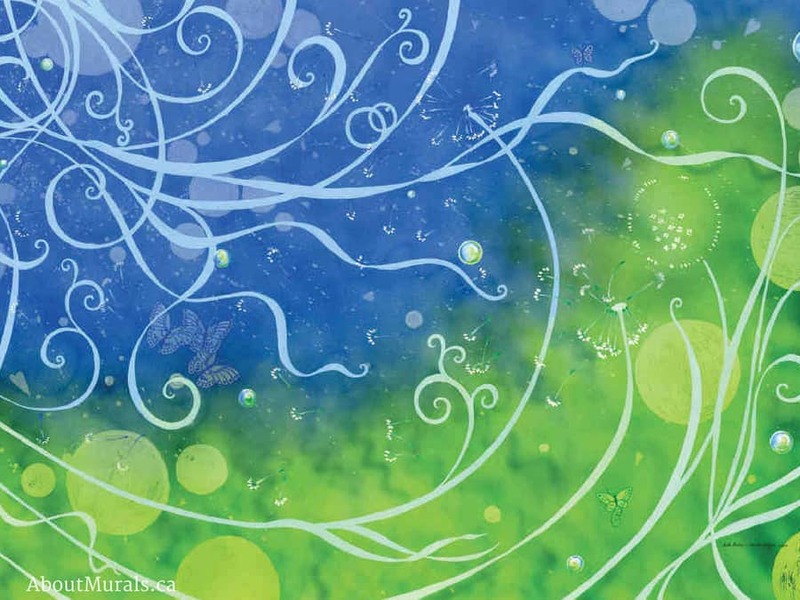 How did you paint the butterfly mural? I’m ashamed to say, Audrey was four and a half before I finished decorating her bedroom (*cringe*). As a mural artist (and seller of wallpaper murals), I love making cool rooms for kids…but after going up and down a ladder all week, decorating my own house is always the last thing on my mind when the weekend rolls around. Happily, I had to take 2 weeks off at Christmas to hang with Audrey, so I finally pulled the pin and got to work making her “big girl room” which also included taking the bed rails off her bed. Yippee! Here’s a quick time lapse video of how I painted Audrey’s mural. I loved having her hang out with me while I painted it – she got a real kick climbing up and down the ladder. For more detailed instructions, keep scrolling! So this is the “Before” shot. 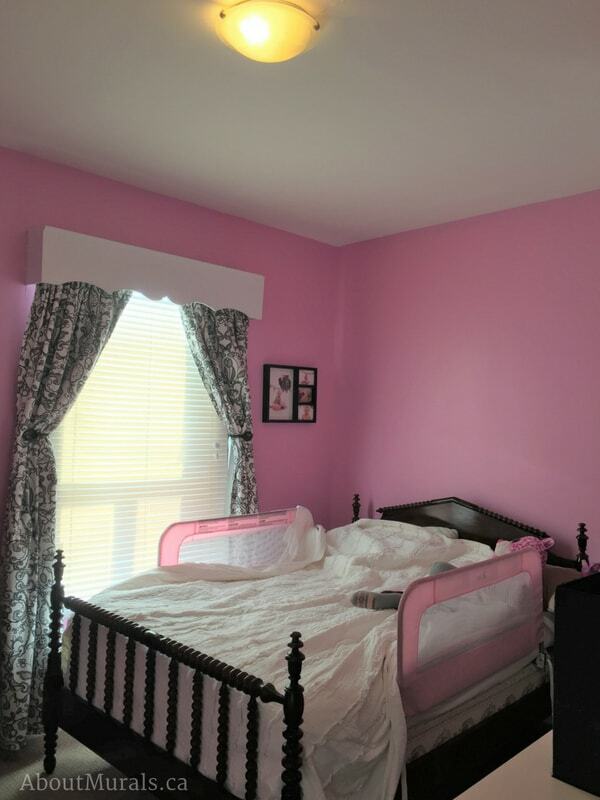 Before redecorating her room, I sometimes felt like a bottle of Pepto Bismol exploded on her walls. Audrey is pink obsessed and loved the colour, but I felt like it needed to be softened a bit. I sat down and did a consultation with her and she approved of my butterfly mural design. Before I painted the butterfly mural, my hubby patched the ceiling and I painted it and he also added a pretty ceiling medallion and a new chandelier. Then I painted the wall behind Audrey’s bed in white, breaking up the pink a little bit. Sometimes clients call me and say they want a mural painted for their kids, but don’t know what they want. 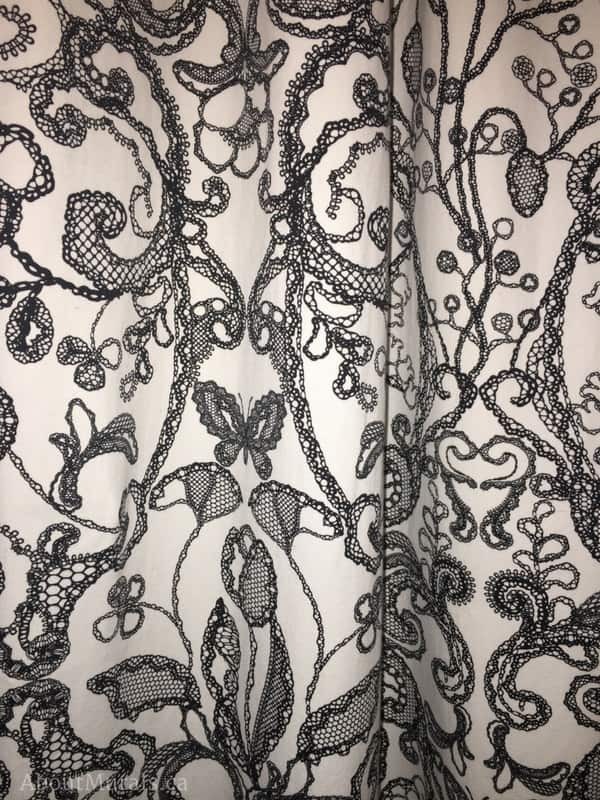 One suggestion I always give is to use drapes or bedding as inspiration. 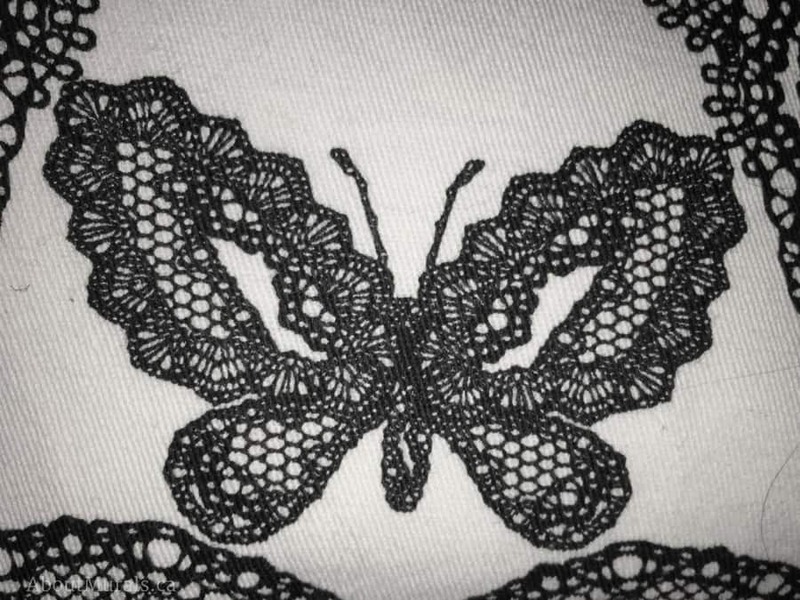 So for Audrey’s butterfly wall mural, I pulled the butterfly from her drapes. I snapped a close-up photo of the butterfly from the drapes and then put it into a Word document. Then I printed the image out on both paper (so I could have all the small details close by when I was painting the mural) and a transparency to put onto my overhead projector. The great thing about using an overhead projector to paint wall murals is that you can make the image bigger or smaller or move it around on the wall until you’re happy with the layout. I only use non-toxic acrylic paints and no-VOC latex paint, so it won’t affect the air quality in kids’ bedrooms. They can sleep in their room the same night I paint my wall murals. 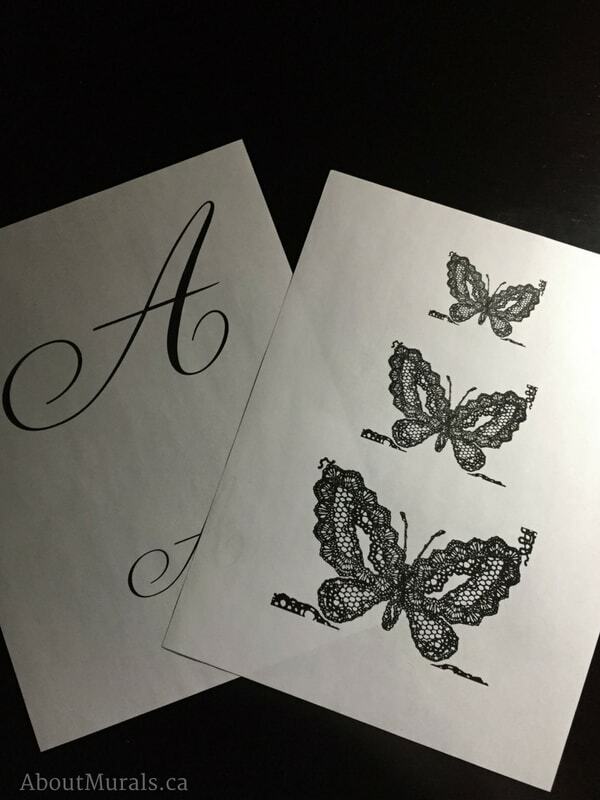 Still thinking of a butterfly mural for your kids room? Here’s how I might be able to help! I’ve painted kids wall murals since 2005 and have even painted for a Mike Holmes TV Show! If you’re in the Hamilton/Toronto area, get in touch for a free quote. They start at just $350. 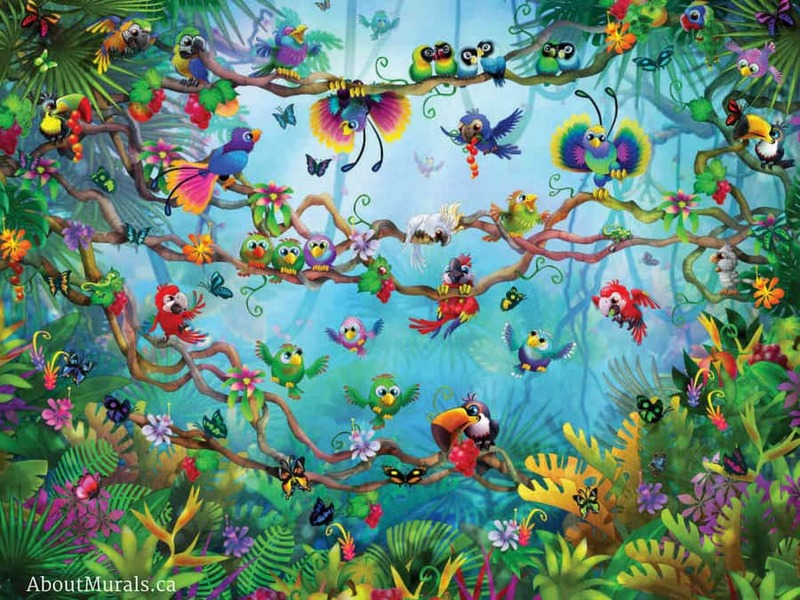 Check out my wallpaper murals – they ship worldwide! I also sell removable wallpaper murals that ship for free in the USA and Canada – and they’re super simple to hang. I’d love to have you in my community! I like to share photos of my murals to inspire, DIY tips and my latest red hot deals. I’ll leave it up to you where you follow me – my newsletter, Instagram or Facebook.